I had the pleasure of celebrating my own 6th wedding anniversary this past December 22nd. Having been a December bride (mind you with no snow!) 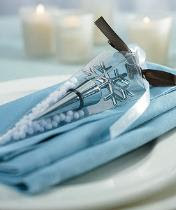 I am still enamored with all things sparkling and snowflake themed. To bring color, fun, and just plain good taste to an industry that often surrenders to the comforts of tradition. Their studios’ stylish output aims to help brides jump out of the predictable wedding box. Their products speak to brides that feel overwhelmed by monstrous wedding invitation binders, petal paper and organza everything. I truly believe she has accomplished that goal and I couldn’t help but fall in love with this Snowflake Wine Stopper favor -and it’s only $2.50!! What a dazzling find for any winter bride! 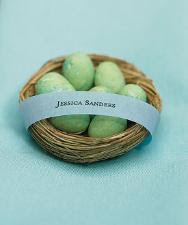 And for those of you who are spring brides, you won’t be able to resist this dainty Miniature Natural Birds Nest favor either. It’s just adorable! If you’re having a spring wedding, get creative and use those egg-shaped malted candy eggs to put inside! Whatever your theme or dream, you’re sure to find a spectacular and unique wedding need at Wedding Tulle!